1939 This year has often been called the "greatest year in film history" by film buffs, movie historians, and critics, chiefly due to the inordinate number of classic films. Some of the greatest films ever made were released in 1939, including Gone With the Wind, The Hunchback of Notre Dame, Mr. Smith Goes to Washington, Ninotchka, Stagecoach, The Wizard of Oz and Wuthering Heights. In France, both Marcel Carné's Daybreak (aka Le Jour Se Lève) and Jean Renoir's The Rules of the Game (considered by some to be the greatest film of all-time, but banned during the German occupation) were released. 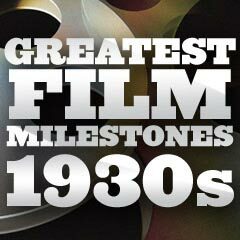 Other major classic films in 1939 included Beau Geste, Dark Victory, Destry Rides Again, Love Affair (later remade as An Affair to Remember), Only Angels Have Wings, Gunga Din, Midnight, Of Mice and Men, The Women, Young Mr. Lincoln, and many more. 1939 Gone With the Wind (1939), directed by Victor Fleming and starring Clark Gable and Vivien Leigh, was world-premiered in racially-segregated Atlanta, Georgia. It was exactly 75 years after General Sherman had set the city on fire in 1864 during the Civil War. This big-screen adaptation of Margaret Mitchell's best-selling novel was a 228-minute Civil War epic drama that went on to profitably gross almost $200 million (domestic). With a production cost of over $4 million - it was the longest and most expensive Hollywood sound film of the time. It also remains the domestic box-office champ with a gross of $1.67 billion (adjusted for inflation). Its casting call for the lead female role of Scarlett O'Hara ended up being one of the biggest ever with multiple actresses being considered for the highly desired role, ending when little-known British actress Vivien Leigh signed on for the role. It was nominated for thirteen Oscars, and won eight competitive statues (including Best Picture) - a record for its time, and two special awards in the awards ceremony in early 1940. It was the first color film to win Best Picture. Best Supporting Actress Hattie McDaniel became the first African-American performer to win an Oscar, Best Supporting Actress (she was also the first African-American nominee for an Oscar, and the first African-American guest at the awards ceremony). However, McDaniel and other black cast members couldn't attend the film's premiere in mid-December 1939 in Atlanta. 1939 Of the ten films nominated for the Best Picture Oscar in 1939, actor Thomas Mitchell starred in three of them - a record: Gone with the Wind (1939) as Gerald O'Hara, Mr. Smith Goes to Washington (1939) as Diz Moore, and Stagecoach (1939) as Dr. Josiah Boone. In the single year, he had roles in three films nominated for Best Picture. (He won for his nominated supporting role in Stagecoach (1939).) This same feat occurred for John C. Reilly in five films nominated for the Best Picture Oscar in 2002. 1939 MGM’s classic musical The Wizard of Oz (1939) starring Judy Garland as Dorothy, premiered in Hollywood at Grauman’s Chinese Theatre on August 15, 1939. 1939 John Ford's classic frontier western Stagecoach (1939) was the first film that the director shot in Utah's Monument Valley -- the site would repeatedly be used as the locale for most of his other Westerns. The film marked the breakthrough, star-making role for B-western actor John Wayne, as Ringo Kid. 1939 Swedish actress Ingrid Bergman made her American film debut (and English-speaking debut) as piano teacher/concert pianist Anita Hoffman in Intermezzo: A Love Story (1939). She starred opposite Leslie Howard (as world-famous violinist Holger Brandt). It was a remake of the Swedish version of the same film made two years earlier as Intermezzo (1936) (and released in the US in 1937). 1939 Dashing, athletic silent film movie star Douglas Fairbanks, Sr. ("The King of Hollywood"), the husband of Mary Pickford, and known for his swashbuckling roles (The Mark of Zorro (1920), Robin Hood (1922), and The Thief of Bagdad (1924)) and for his co-founding of United Artists, died of a heart attack at the age of 56. 1939 British actor Basil Rathbone, as Sherlock Holmes - with an Inverness cape and curved-stem pipe, was accompanied by dull-witted, pipe-smoking Nigel Bruce as Dr. Watson, in their first appearance together as the crime-fighting duo, in 20th Century Fox's The Hound of the Baskervilles (1939). It was the first of 14 screen pairings for the actors from 1939 to 1946. In the same year, they also starred in Fox's The Adventures of Sherlock Holmes (1939). Their next twelve Sherlock Holmes films were made for Universal. 1939 Director George Cukor filmed the 1937 Broadway hit as The Women (1939), based upon Claire Booth Luce's play. It was notable for having an all-female cast, featuring all of the female stars at MGM (except for Myrna Loy and Greta Garbo). 1939 With his supporting roles in Frank Capra's You Can't Take It With You (1938) as Donald and Gone With the Wind (1939) as Uncle Peter, Eddie "Rochester" Anderson became the first black performer to appear in more than one Oscar-winning Best Picture. This led to his top billing in the MGM musical Cabin in the Sky (1943). 1939 The future rival to film -- television -- was formally introduced at the New York World's Fair in Queens. The Radio Corporation of America (RCA) unveiled a display of its first TV sets for sale to the American public. 1939 Detective Comics introduced the character of super-hero Batman in issue No. 27, released in March of 1939. Batman was the first DC Comics character to have his own serial, Columbia Pictures' 15-episode serial Batman (1943). 1939 The first of four 'backyard' musicals, directed by Busby Berkeley and starring young Judy Garland and Mickey Rooney opened - Babes in Arms (1939). Its success spawned three other similar films: Strike Up the Band (1940), Babes on Broadway (1941), and Girl Crazy (1943). 1939 Mercury Theater stage company founder and CBS radio drama series originator Orson Welles - after his momentous radio adaptation of H.G. Wells' The War of the Worlds on Halloween night 1938 - signed an unprecedented contract with RKO Pictures in 1939. It was a two-year, two-picture contract as producer-director-writer-actor, in which Welles reserved complete control over all aspects of two productions of his own choosing, including "final cut," as long as he remained within the studio-approved schedule and budget. Although resented by many in Hollywood, it led to more individual control by talented filmmaking individuals, and to Welles' considerable artistic control over his production of Citizen Kane (1941). 1939 Two of the greatest Hollywood-related gossip columnist rivals competing for readership in the late 1930s were Hedda Hopper and Louella Parsons, who worked for William Randolph Hearst's syndicated newspaper chain. The Hopper column made its debut in early 1938 in 13 newspapers, including the Los Angeles Times. Her first startling, scandal-tinged article, published in October of 1939, scooped Parsons on the impending divorce of James Roosevelt, eldest son of President Franklin Delano Roosevelt. He had left the government as an aide to his father in 1938, and went to Hollywood to work in the movie business as an aide to Samuel Goldwyn. Roosevelt's first marriage to Betsey Cushing eventually ended in divorce in 1940. The two "Queens of Celebrity Gossip" helped to fuel an industry of celebrity-gossip that exists to this day. end of the 1930s The eight largest US film studios raked in 90% of US film profits at the end of the 1930s.